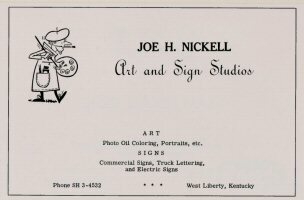 During operation of my sign shop in West Liberty, Ky., from about 1958 to 1967 (Art and Sign Studios becoming renamed Joe Nickell Signs - see Sign Painter), I sold electric signs. I priced stock Plexiglas signs at retail from a catalog, then purchased them wholesale from a manufacturer who produced the custom lettering from my original pattern. 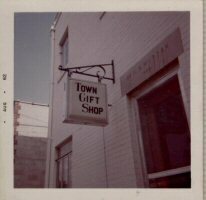 Shown is a rather plain "Town Gift Shop" sign; another, for a flower shop, had "Lewis" in red and "Florist" in a green ribbon script.